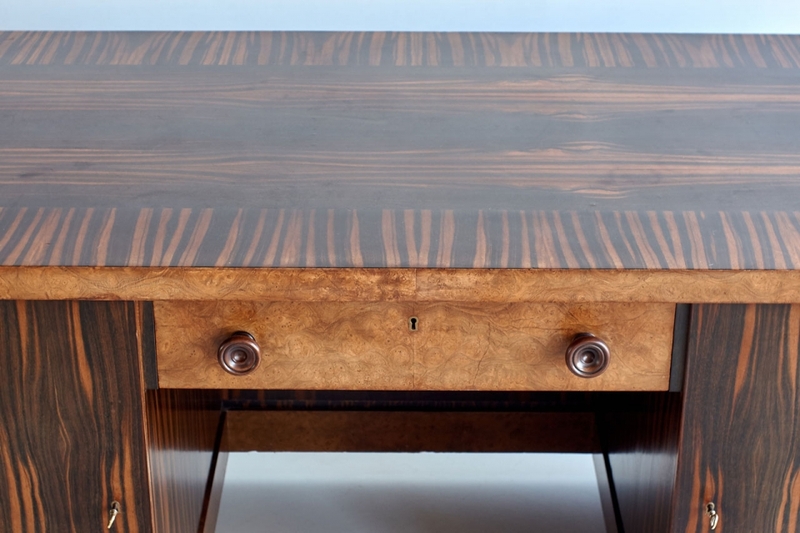 This double pedestal base executive desk, executed in macassar ebony and walnut veneer, is a custom made piece designed for a gentleman’s room in The Hague, early 1930s. 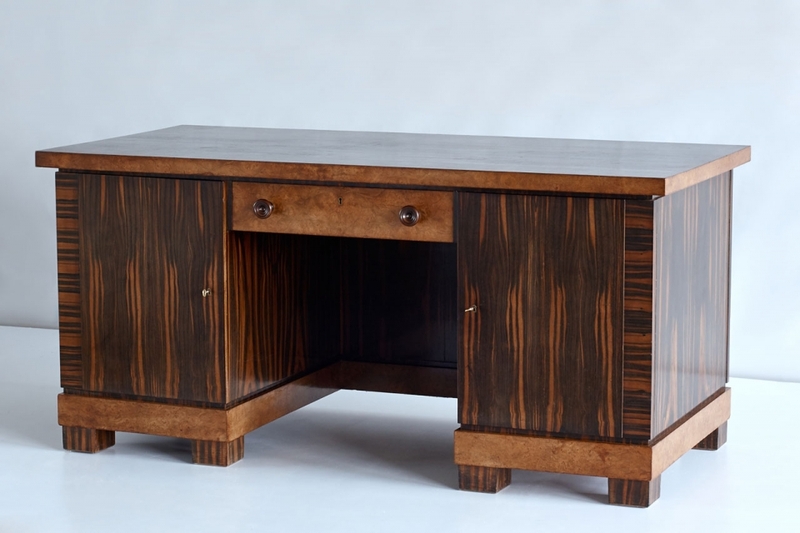 The contrasting way the different kinds of wood have been inlaid and the particularly graphic macassar ebony woodgrain makes this a stunning piece of art deco craftsmanship. The design is attributed to Paul Bromberg, who was one of the main interior designers for the renowned Pander manufacturer and shop, often working on private commissions. Pander kept an extensive stock of all kinds of wood, including the most precious and exotic kinds such as this macassar ebony. Biography: A former apprentice of the renowned architects and designers Jac. van den Bosch and Hendrik Berlage, Paul Bromberg (1893-1949) became the first designer of the Metz & Co interior department in 1918. Not only did Bromberg design furniture for the department store’s own collection, he was also responsible for buying the Art & Craft supplies, for which he often travelled throughout Europe. In 1924 Bromberg started working for the Pander company, designing both unique interiors and furniture pieces, often produced in series. At the time, Pander was the largest and best known furniture producer in the Netherlands, with shops in Amsterdam, Rotterdam and Den Haag. Bromberg emphasized functionality over ornamentation in his designs. 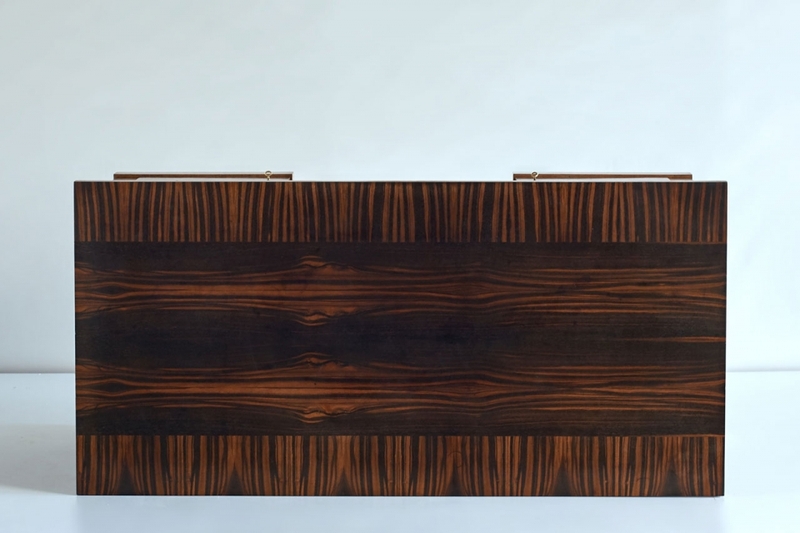 His designs offered a highly distinctive character through the combination of different kind of woods in the same piece. Bromberg was also a passionate design theorist. Through exhibitions, lectures, model houses and publications he presented his visions about new ways of living. His singular designs and tireless efforts as a publicist made Bromberg hugely influential in the development of interior design in the Netherlands during the first half of the twentieth century. Bibliography: Paul Bromberg: Binnenhuisarchitect en Publicist, M. Teunissen. Uitgeverij 010, Rotterdam, 1987.